Faith Comes by Hearing has developed a new approach to Scripture recording. In the past they would only accept to do a recording for complete New Testament, primarily because of the time and expense to bring a team on location. It wasn't cost-effective to do this for just a few books. They have 32 active teams which go and spend one to two months in a location to do the recording. Now they are retooling for the virtual world which will make some of the traveling unnecessary. They've set up a virtual audio recording site. An online presence at VirtualRecording.com, the new system opens up participation in Scripture recording to anyone with a computer, microphone and Internet connection. The ministry's traditional recording method (which will continue to be used) requires teams to travel to the region where a language is primarily spoken and find participants. With Virtual Recording, speakers of a language who have moved to other parts of the world are now also prospective recruits for voice talent - effectively broadening the pool of possible participants to a global level. On the website, participants audition for roles using a computer and headset. The quality of the recording is determined, as well as the suitability of the participants for each role. The actual recording is done in the web browser although the files are stored locally and then uploaded when possible. Apparently it can be done in areas with mediocre connectivity. The traveling teams use their down time to process the virtual data and upload it back to the web so the team can verify it and make changes. Go to the website to find out more! Alex Kerr has felt the Lord's calling to develop an app to publish Christian materials on the lowest of the low feature phone. The minimal phone he develops for has only 64K of RAM and can run Java apps. If you've had experience installing apps like goBible on feature phones, you'll know that often a phone will reject the file because the size it has been compiled at is too big for the phones memory. The PhonePublish code, however, is something like 12 K in size. It will detect the available memory in the phone and its screen size and expand to use it all. The developer is seeking support right now to work on this full-time. The current version does not handle special characters, but he has a plan to meet this need if he can only be freed up to work on it full-time. Larry Matthews was proudly showing a $28 “dumb” phone with the complete NT on it. No, it’s not a feature phone—it just has a camera and a 240 x 320 screen that shows JPEGs. Robert Hunt has been working on some technology to produce this by first creating pdfs of the appropriate dimensions and then converting them into JPEGs. For the user, the directory structure is set up such that there is a sub folder for every book, and probably a subfolder for each chapter. You find the book and chapter that you want and open the first image. After that, navigation is done simply by using the control pad on the phone, right arrow to advance to the next page, and back arrow to go back a page. If the JPEG was created for the exact resolution of the screen, the text is very readable. I was skeptical at first, but must say that having seen it, I'm quite impressed. Larry has put up instructions on how to do this on the LingTranSoft site. Richard Margetts has been quite busy in his spare time, considering that software development is not his day job. He's put together a nice Scripture app for android that takes USFM text and compiles it into an APK file for android. The interface is quite nice: scroll up and down in a chapter, or scroll left or right to advance chapters. Being that Richard’s day job is Scripture engagement, he's given a lot of thought on how to make the interface customizable and appealing for a target audience. This Scripture audio files can also be embedded in the app and tagged in such a way that the verse text is highlighted in the app as it is being read. Very nice for new readers to follow along! Please note that this is in the early stages of development and though I have a working version on my phone for testing, it may be a few months before the Scripture app compiler can be released. Richard has also developed a very nice-looking dictionary app for android that has most of the functionality of Lexique Pro. It is for display only, mind you, but the idea is that this app is one of the outputs of the Lexique Pro Windows application. If this is something you've been waiting for, you'll have to make some noise. Apparently there is a beta version of Lexique Pro for Windows that can help you compile the android app, but I haven't seen it yet and it isn't available for download on the website. So if you think that there would be a great audience for such an app, you'll have to let our language technology and lexicography community know so that we can offer some assistance to Richard in pushing this thing out the door. The app was not presented at EMDC, but I included it for good measure. Haiola can produce Scripture in several HTML formats and more formats that are not even listed in the documentation yet. If you want or need the power to fine tune the output, then Haiola is for you. But if you just want a simple output path for your USFM files, there is an easier way. The same scripts that are used in Haiola to perform the conversions also exist on the Web server at http://freely-given.org There, you can upload USFM files, wait 20 min. or so and receive a link back by e-mail pointing to dozens of different output formats of those Scripture files. Just download the one you want to use and in most cases it will serve you well. I used this process to put the Fulfulde Scriptures on my android phone using the AndBible app. Geoffrey Hunt and Maurice Manktelow have put together a website and documentation for a text-free navigation system for cell phones using icons in basic HTML and CSS files. It is a way of organizing multimedia data, so that it can be easily accessed by someone who is not literate. The SLISS template files can be customized by a person with average IT skills; it just requires patience. Once customized, it can be easily replicated. This device is well designed and suited to beaming multimedia content via WiFi, Bluetooth broadcasts, and even by SD card through a built-in duplicator. It can also serve up web pages for delivering web content without access to the Internet. The price range was higher than I anticipated at between $400 and $600 depending on the included accessories. http://renewoutreach.com does not yet have this product listed on their website even though they launched the product at the conference. 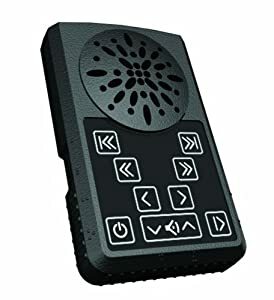 Megavoice continues to develop an assortment of tiny mobile and solar powered Scripture audio devices. You can even now choose a stuffed animal with pocket to keep them inside! Davar Partners has created an audio player similar in size to the Megavoice device. They claim it has been tested to military specs and can survive being driven over with a car on pavement. The device is about the size of a cell phone and very light. They were selling a starter kit with sample devices to allow you to encrypt your own content to be put onto an SD card and used by the player. Since I can't seem to find the starter kit on their website, it must have been a conference-only special. Please contact them if you are interested. I was so impressed with this device that I had to buy one. It's a small LED lantern device with a built-in radio, and MP3 audio player. It includes a small solar panel to charge it in the box. This device does not use proprietary formats or encryption like a number of other Scripture players. There is an SD card inside that you can only access by taking out the screws. Whatever content you put on there is not likely to be tampered with because in addition there is a USB port that allows any other content on a thumb drive to be inserted and played. The lamp produces a dim light that can last over 30 hours, but also has an extremely bright lantern setting, the brightest LED lamp I've ever seen. I believe that the pricing on these units is about $25-$30 each. It is listed as an Indiegogo fundraiser project, but it seems you can already place and receive orders. This is an incredible cinema quality video camera that costs about $1,000 and looks like nothing more than a little instamatic camera when no extra lenses are attached. The idea here is the ability to be a little less conspicuous about video creation, calling less attention to yourself or the equipment. MAF has developed a multimedia library system that is designed for offline transmission between devices. While the content is hosted on their server, transmission between devices is done when the sending app generates a QR code that the receiving app scans and receives. Content can be books, notes, audio files, video files, or even a training course. The sample books that came with the Estante download were opened in the Aldiko ereader installed on my device. Other content types are opened in a pdf reader or a browser on the device, but the training courses are opened in the Estante app itself, although I haven’t found instructions on how to create courses in the format it expects. MAF suggests that the content be kept simple because their model is that of a pastor/mentor who visits occasionally and shares more materials on each visit. I presented my WikiTablet device, where an Android tablet is configured to be a webserver that runs a wiki site. As a trainer, you add your content to the portable wiki site. At the training event, you pass out the IP address of the tablet and the participants can connect and view the contents on their computers. Information on how to set this up is available on the website. The Bloom book creation app was presented. It is a simple, template driven approach to creating books in local languages without the complexity associated with desktop publishing. Compare its level of complexity to basic Powerpoint: If someone can add text and a picture to a PowerPoint slide, then they can handle most of what is required to create a Bloom booklet. For the EMDC crowd, the app was especially relevant for groups who have materials that they want to distribute in multiple languages. The platform allows for easy translation of content into other languages provided the organization can use the existing templates or create their own custom templates for the master copy. I hope you've appreciated a glimpse at the technologies presented at EMDC. May the Word of the LORD spread to the ends of the earth!